Are you looking for orchids that can withstand temperatures close to freezing, will grow from simple leaf cuttings and reach flowering size in two or three years, and will then flower repeatedly from each mature growth? Then restrepias are the orchids for you. Their flowers range in colour from yellow through orange, brown, pink and red, some also with spots or stripes. Mostly their flowers are small but Restrepia antennifera ‘Goliath’ has flowers in which the fused lateral sepals are approximately 50 mm in length. The flowers are best described as curious, rather than beautiful, their filament-like petals and dorsal sepal giving them the appearance of insects; some unfeeling cymbidium growers refer to them as cockroach orchids! Most restrepia species grow into specimen plants in as little as five years, provided of course, that one is able to resist the temptation to take leaf cuttings to grow into divisions to swap or sell! The genus Restrepia is one of 26 different genera that comprise the sub-tribe Pleurothallidinae. 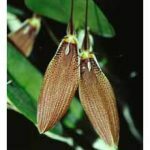 All are natives of tropical and sub-tropical America, the most widely grown genera, apart from Restrepia, being Masdevallia, Dracula, Pleurothallis, Stelis and Octomeria. The genus Restrepia commemorates José E. Restrepo, a Colombian explorer of the Andes. Restrepia antennifera (the type species) was found by Alexander von Humboldt in the early 1800s in the Colombian Andes, where it grew on tree trunks at an elevation of 3000 m. Humboldt and Kunth described it in 1815. Ever since that time there has been much mis-identification and confusion of the genus as a whole, and identical species are still frequently exhibited under different names. The flowers of restrepias are easily distinguished from those of other pleurothallids by their dominant fused lateral sepals (sometimes referred to as a synsepalum). Their petals and lateral sepals are narrow and filament-like, while the lip sits flat on the synsepalum and is so well camouflaged that it is often overlooked. In fact, the shape of the labellum is an important factor in distinguishing one restrepia species from another. The flowers are borne singly on inflorescences that emerge from stem sheaths behind the leaves. Each mature leaf produces four or five flowers over a period of several months. Under favourable conditions of temperature and humidity individual flowers may last for several weeks but it is uncommon for two flowers to be produced by the one leaf at the same time. In nature, restrepias are found from Mexico to Argentina, always growing in mountainous country where the humidity is high and temperatures cool to temperate. 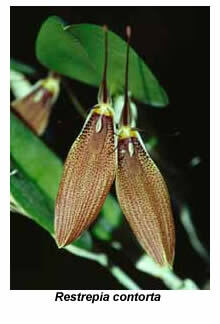 Restrepia antennifera grows in Colombia and Venezuela at altitudes ranging from 2100 to 3600 m, while R. trichoglossa (syn. R. elegans ) has been found on mossy tree trunks near Tovar ( Venezuela) at altitudes of 1500-1800 m. Under cultivation restrepias are able to withstand a large range of temperatures (0-40°C), provided that exposure to the extremes is not prolonged. I grow most of my restrepias in a temperature-controlled glasshouse in Melbourne, the main advantage being that I can limit the temperature in summer to a maximum of 30°C by use of an evaporative cooler. The minimum temperature of 11°C in this house is unnecessary for restrepias, as other Melbourne growers have equally good results when their plants are grown under shade-house conditions, where temperatures occasionally fall near to freezing point in winter. As for masdevallias and other pleurothallids, restrepias must never be allowed to become totally dry. A variety of potting mixes may be used, provided that they drain well, yet retain some moisture. Sphagnum moss, used either alone or mixed with polystyrene foam or perlite, gives good results. It’s advisable to re-pot every year or two, because the moss seems to deteriorate if left longer. In my experience, plants in large pots seem to grow better in a well-drained mix, rather than in moss alone. Restrepias respond well to the occasional application of liquid fertilisers, provided that the concentration is not so high as to kill the moss. Restrepias have no definite resting period but in cultivation they seem to grow fastest in autumn and spring, probably because the temperatures and humidity during these seasons are more favourable. They would probably grow at the same rate all year if a temperature range of 8-20°C, like that of their natural habitat, could be maintained throughout. The main flowering season is winter and spring, although a few flowers are produced at other times. Again, they would probably flower continuously given better temperature control. Restrepias grow so rapidly that their plants may be divided every few years. An alternative way to produce extra plants is by taking leaf cuttings. Simply remove a leaf with 25-50 mm of stem attached and push the stem into some Sphagnum moss in a small pot until the blade of the leaf touches the surface of the moss. Within a few months a new growth will emerge from the sheath at the base of the leaf; in most cases the new plant will produce its first flowers within a year or two. Mature leaves that have flowered once or twice give best results; those that have flowered repeatedly and exhausted all their growth buds may fail to produce new plants. Leaf cuttings taken in spring seem to produce new growths most rapidly. Occasionally, new plants (complete with roots) emerge from the stem sheaths of mature restrepia plants. These keikis grow very rapidly if carefully removed and potted separately in moss. When preparing restrepias for a show, carefully cut off the old flower stems, which otherwise detract from the overall appearance. Then insert the pot in a larger squat pot packed with damp moss – this helps to maintain a higher level of humidity around the plant and thereby reduces the risk of the flowers collapsing during the show. Remember to hide a few pellets of snail killer in the moss, just in case a slug or snail is lurking there ready to destroy your masterpiece overnight; restrepia flowers seem to be particularly attractive to these pests. Maybe cockroach orchid isn’t such a bad name for restrepias after all – certainly, both cockroaches and restrepias multiply and grow rapidly and are hard to kill! Under favourable conditions a small plant will develop from a leaf cutting into an attractive specimen plant carrying twenty or thirty flowers within four or five years. And a further advantage for aging cymbidium growers is that these specimen plants fit into 100 mm pots!